Eric Val's website describes his music as "diverse music with a hard rock edge," and I guess that's a description that fits. 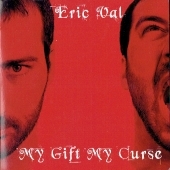 "My Gift My Curse" is loaded with chunky guitar riffs and some interesting solos. They're paced at about the Bad Company level, more classic rock than some of the harder stuff, like Twisted Sister. And there's a ton of musicians here, playing everything from the expected electric guitars to the not-so-expected bagpipes, fiddle and trumpet. For some reason, however, I was four songs in before I found one that actually caught my attention: "Trust No One," with its Lynyrd Skynrd edge. The first three songs, including the song I believe is considered the first single ("My Own Hell") just didn't click with me. Nor did many of the subsequent tracks (although many did have moments of brightness). I'm not sure if the problem is a question of production ("My Gift My Curse" seems a little flat) or the fact that I'm just not a huge fan of Val's vocal style (his website states that he is "classically trained" but his voice doesn't sound bold or confident enough to me). The album does have its surprises--what with the bagpipes and jaunty rhythm on "Reflection" and the aggressive metal growls on "Stronger"--and I give Val props for that. His music certainly is diverse. But don't take my word for any of this. Head on over to ericvalmusic.com and give it a listen yourself and let me know what you think.